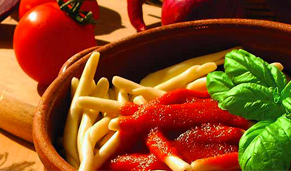 Fiorillo italian pasta factory is a young reality in the field of the food pasta in Calabria. Established in 2001 as individual firm,today Pastificio Fiorillo become a society that all partners are brothers that's why our firm is a familiar management in all sectors: marketing , production ,commercial administrative. whose stings of strength reside in the family management and in the handicraft quality of his own products. The firm, thanks to the use of the most modern technologies of the sector and above all to the employment of fittingses and machineries, produces handicraft pasta of high quality from the characteristics typical of the handmade pasta : clear color; rugged shhet of pastry and never shiny; scent typical of the pasta done in the house. The scent and the taste of the wheat that are tasted eating our pasta they testify the undisputed quality of a product that, particularly for the regional formats, it is unique and inimitable. Pastificio fiorillo's leading product is the Calabrian (both coolness dry) Maccaroni, that cover the greatest part of our production .Currently the Pastificio has a productive capability of 24 qls per day, that become 36 qls in some periods of the year when the working day is organized on three turns. The Pastificio is still in growing phase , our purpose is to increase the sales and therefore the production up to reach in the next two years the 100 qls of daily production, maintaining, obviously, the same standards qualitative. To satisfy the demands of the diffused clients in the various Countries of the world we are even endowed of an high flexibility of packaging. The Reference Markets are: local (Calabria) for the fresh pasta; while dry pasta almost entirely comes exported among the center and north Italy and the foreign Countries like Canada; Australia; Germany; France and Spain. Currently, for a business choice, our products are not available in the Great Organized Distribution but only in niche markets where the typical handicraft products and of quality they find space.